Attach your LCD and keyboard to the 200 Combo and free up space. 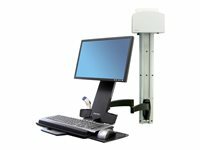 This wall unit solution features 3-point telescoping motion, providing greater reach to bring the system to where it's needed.The 200 Combo holds a monitor, bar-code scanner, keyboard, wrist rest and mouse on the same arm. Arm extends and retracts; fold back out of the way when not in use. A unique cable management system conceals and organizes cords, making cleaning a snap!